Cancer Warrior Inc. - News and Blog Page — Cancer Warrior Inc.
Each month CWI offers a special Item of the Month. All donations of $125 and up in April receive this special item free, in appreciation for your donation. Our featured Item of the Month is this colorful art pillow "Celebrate" created by CWI founder, Micol Sanko. With your generous donation of $125 or more to CWI between April 1 - 30, 2019, you will receive this artful 18 x 18” pillow as our special thank you - FREE! Each month CWI offers a special Item of the Month. All donations of $125 and up in March receive this special item free, in appreciation for your donation. Our featured Item of the Month is this enigmatic art pillow "Hummingbird" created by CWI founder, Micol Sanko. 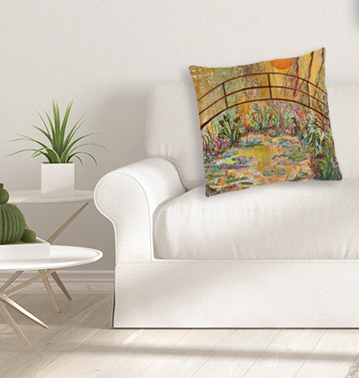 With your generous donation of $125 or more to CWI between March 1 - 31, 2019, you will receive this artful 14 x 20” pillow as our special thank you - FREE! Each month CWI offers a special Item of the Month. All donations of $100 and up in February receive this special item free, in appreciation for your donation. Our featured Item of the Month is this lovely art trivet "Tiger Trivet" created by CWI founder, Micol Sanko. With your generous donation of $100 or more to CWI between February 1 - 28, 2019, you will receive this beautiful 7 x 7" art trivet as our special thank you. January - Item of the Month - HAPPY NEW YEAR! Our featured Item of the Month is this stunning art print "Desert Bloom" created by CWI founder, Micol Sanko. With your generous donation of $200 or more to CWI between January 1 - 31, 2019, you will receive this beautiful 10 x 14" art print as our special thank you. Our featured Item of the Month is a stunning art print "December" created by CWI founder, Micol Sanko. With your generous donation of $200 or more to CWI between December 1 - 31, 2018, you will receive this beautiful 11 x 11" art print as our special thank you. Our featured Item of the Month is a stunning art print "Oasis" created by CWI founder, Micol Sanko. With your donation of $200 or more to CWI between November 1 - 30, 2018, you will receive this beautiful 11 x 11" art print as our special thank you. Our featured Item of the Month is a stunning art print "Lion" created by CWI founder, Micol Sanko. With your donation of $200 or more to CWI between October 1 - 31, 2018, you will receive this beautiful 11 x 14" art print as our special thank you. Our featured Item of the Month is a stunning art print "Blue Past" created by CWI founder, Micol Sanko. With your donation of $200 or more to CWI from August 1- 31, 2018, you will receive this beautiful 16 x 20" art print as our special thank you. Donate to Cancer Warrior Inc. today and receive this beautiful item. With your generous donation of $200 or more to CWI from April 1- 30, 2018, you will receive this beautiful 11" x 17" art print as our special thank you. April's featured Item of the Month item is a stunning art print "Victory Breakthrough" created by CWI founder, Micol Sanko.